The South of France is very well-known not only for its large variety of landscapes and its exceptional climate, but also for its delicious food. So if you love the French cuisine, you must try the traditional food in the Cote d’Azur and in Nice, enriched by their Mediterranean influences. First and most notable feature of the cuisine of Cote d’Azur is the use of olive oil: the French Riviera is in fact one of the main suppliers of olive oil in France. Other typical ingredients are seafood, fish, vegetable and fruit, and the extensive use of a wide range of herbs, such as bay leaves, basil, thyme, oregano and garlic. The traditional food of Nice features all these characteristics. 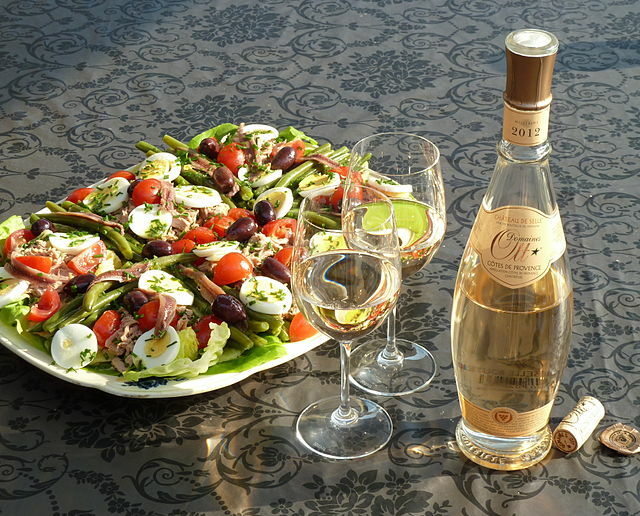 First and most typical example is the Salade Niçoise, whose origins are not well-defined, as well as its ingredients. There are in fact many versions of this salad, but the list of ingredients usually includes anchovies, tuna, slices of hard boiled eggs, steamed potatoes, and fresh vegetables such as tomatoes, shallots, red peppers and steamed green peas, all seasoned with Dijon vinaigrette. Another internationally famed recipe originated in Nice is the Ratatouille, a mixed of cooked vegetables and fresh herbs, usually served as a side dish. Also in this case, there exist many different international versions of Ratatouille. Less famous, but not less characteristic, is the Socca, a popular street food which consists of a crispy, flat unleavened pancake made of chickpea flour and olive oil, served hot and heavily seasoned with pepper. It is similar to the Italian farinata or cecina and the Argentinean faina. Being gluten-free, it suits all palates. Another classic specialty of Nice is the Farcis: vegetables – usually tomatoes, eggplants or courgettes – stuffed with ground meat, garlic and bread crumbs and baked. They can be served hot or cold. The Soupe au pistou is an ancient traditional dish, popular throughout Provence: it is a bean soup flavoured with pistou, a sauce made of garlic, basil and olive oil. Different kind of hard cheese, such as parmesan or pecorino, can also be added. The Pissaladière is the example of a dish which originated in Nice from different Mediterranean influences: it can be described as a thick pizza topped with anchovies, caramelised onions, garlic and olives. Its name comes from the Ligurian and Niçard peis salat, which means “salted fish”. It is usually served as an appetiser. Needless to say, all these delicious dishes should be tasted together with a glass of good wine. If in Nice in the summertime, the best choice is a local rosé: fresh, dry and perfect in combination with the Mediterrean flavours of the French cuisine in Nice.